Aluminum Glazing | Sloped Sunroom & Skylight Glazing System for Passive Solar – Abundant Energy, Inc.
Two Part EPDM rubber gasket system allows glass to move due to thermal changes while still maintaining perfect water seal. Interior gutter system lets condensation weep out (instead of dripping), preventing damage to wood construction elements. Thermal break provides superior insulation from cold. Modularity of Pro-Seal aluminum glazing system elements allow anyone with basic carpentry skills to construct a sunroom framing system that outperforms pre-fab “Four Season Sunrooms” at a fraction of the cost. Abundant Energy has shipped our aluminum framing systems all over the world. From earth ship glazing in Arizona, New Mexico and California to skylight glazing in Canada to commercial and residential passive solar projects in Asia and Europe. We are currently the ONLY supplier of two-part aluminum glazing with EPDM rubber gaskets in the USA. There is no other sloped glazing system in the world that provides equal durability, insulation properties or cost-effectiveness in passive solar glazing / window framing. Abundant Energy has worked with hundreds of contractors, glass suppliers and property owners across the world. Over our 30+ years in business, we’ve helped people get through every possible issue that can occur when installing Pro-Seal aluminum glazing. We offer free phone support with your purchase. Most people find that when using the Pro-Seal system, installing aluminum glazing is easier than they thought it would be. 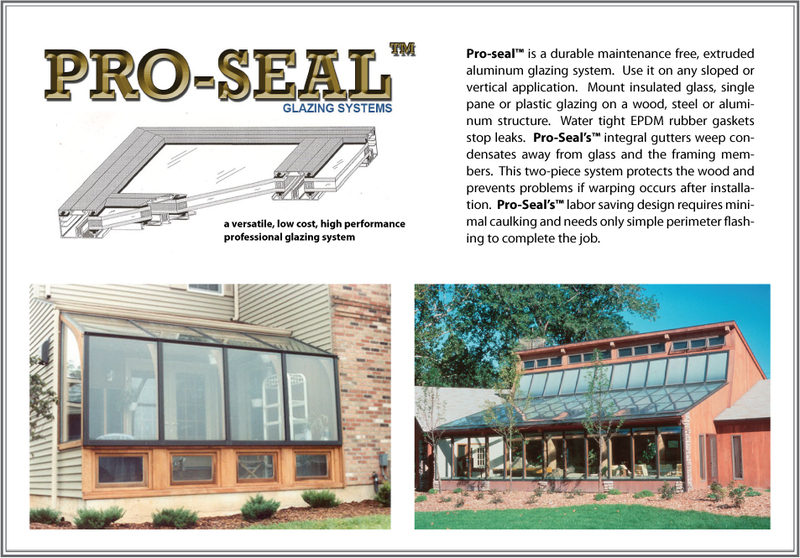 In addition to new passive solar window framing projects, the Pro-Seal system can be used to retrofit old sloped glazing systems. To learn more about the benefits of the Pro-Seal sunroom and skylight glazing system, contact Abundant Energy Inc., today. We’ll be happy to answer all your questions and help you to get started on the passive solar glazing system you’ve been dreaming of!